Owsley County was organized by the General Assembly of Kentucky in 1843. Gov. Robert P. Letcher appointed Luther Brawner of Clay County, Joseph Wilson of Estill County, John V. L. McKee of Laurel County and William Chenault of Madison County as commissioner to locate the county seat of the newly formed Owsley County. The commissioners were instructed to meet at John Moore’s house in Booneville August, the 3rd Monday of 1843. The Commissioners had difficulty in selecting a county seat for the new county. The local people around the small village of Proctor wanted Proctor to be the center for the government of Owsley County. Proctor had been named to honor Rev. Joseph Proctor, a famous Indian fighter. The South Fork citizens held out for locating the county seat at the site of an old camp of Daniel Boone, which carried his name, Boone’s Station, now known as Booneville. In 1884 residents of Proctor petitioned the General Assembly of Kentucky about the county seat problem. As a result of this petition, on February 29, 1844, the General Assembly passed an act requiring an election to be held to settle the dispute about the county seat. The election was to be held starting the first Thursday of April 1844, and held for three days. The ballot gave the voters two choices. They could vote for one place – (1) At Elias Moore’s place at Boone’s Station, now known as Booneville, or (2) at Archibald McGuire’s farm at Proctor. The place getting the most votes would be the county seat. The election was chosen to be held at Lassiter Robertson’s house, and Booneville won by a small majority. Thus Booneville became the county seat of Owsley County in 1844. 1st Sheriff James McGuire, Jr.
Feb. 26, 1843 the General Assembly ordered the 8th Magisterial District set up which was what we call “Upper Buffalo”. The district included all the land drained by Buffalo Creek. Five constables were appointed by the governor in 1843. In the 1843 time period up to 1850 (1850 had a new constitution) officers were appointed by the governor. Circuit judges were appointed and were given the power to appoint the circuit clerk and Commonwealth Attorney. The Governor appointed the surveyors, coroner and justices. The Justices were given the power to nominate people for sheriff, but the governor appointed the sheriff from those who were nominated by the Justices. The Justices were also given power to appoint county clerks and county attorneys. The 1850 constitution created the office of County Judge. Before this date the Magistrates did the duties which were later given to the County Judges. In 1866 James M. Sebastian was appointed to fill out an unexpired term. 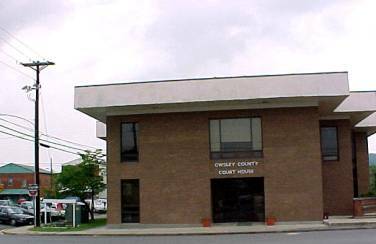 County court clerks were appointed by the fiscal court (magistrates) from the beginning of Owsley County until the “1850 constitution” went into effect which was in 1851. William Williams was the first county court clerk of Owsley and it is believed that he served continuously until after the second election which was in 1854. Seven in 1929. By November 7, 1933 the county had changed to 3 Justices of Peace districts and gave each Justice a bigger district to serve. Title was changed to Magistrate in 1937. A complete listing was not found in Frankfort and as of a few years back neither the Kentucky Historical Society nor the Kentucky State Library and Archives had a legal record of the above listed (1926 & prior, we) officers. 1. Kentucky Historical Society in Frankfort, KY.
2. Listing of Owsley County material at the library and archives. 3. Owsley County Clerk’s office, Booneville, KY.